Faith was couped up in her room with nothing to do. She and Mark would be doing something now, but that was a month ago. Before he wanted space. She gave him all the space he needed. Unfortunately that space became a giant wedge between them. Tearing them apart. Things were never the same again. Faith cried and cried, but it was no use. The tears were therapeutic, but you could only cry for so long. She had to find something to do. She remembered meeting a girl a while back. Aiko. A foreign exchange student. She had always seen her around school, but never really spoke to her. Apparently a manga fan. she had a nice collection herself. Maybe she could go forge a new friend. She packed a few genres in her backpack and went to find the exchange student. Apparently she too was couped up in her room. Huh, her room wasn't that far away from hers. A knock on the door later. Aiko had heard the footsteps coming up the corridor, nothing unusual there. It was certainly more unusual for them to stop outside her and Ashley-san's room and politely knock. 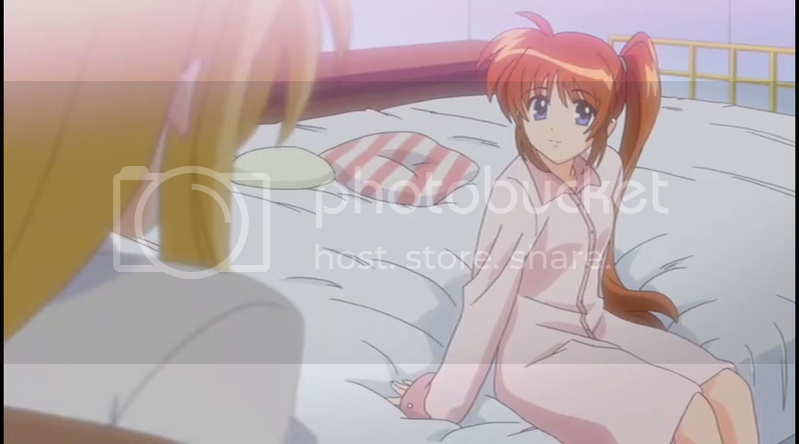 A bit intrigued the blue haired girl paused the episode she'd been watching, Mahou Shojou Lyrical Nanoha: StrikerS was worth watching more than once in her opinion. Leaving it up on the screen of her rather advanced computer, an obvious investment for someone like her, and went to get the door. After a moment, too her, the gynoid recognised the girl standing outside as she was opening the door. "Ah, how can I help you Martel-san?" "" Faith bowed respectfully and spoke in what she thought was Aiko's native language, "" Faith took in everything with a glance from the door. It seemed Rycon wasn't there. And that she was watching StrikerS. Maybe she'd come at the right time. She had a pretty nice collection from what she saw from the door. Then again, Faith was no slouch either. She collected a wide variety of anime and manga. Aiko respectfully returned the bow, it was pleasant in its own way. Admittedly part of that was because it was a private nail in the figurative eye when it came to Takashi's programming of her earlier self. "" Even as she talked the gynoid's mind was whirring away, mulling over Faith's offer of someone to talk to. By the time Karakuri got to the end of the second sentence she had reached a conclusion. "" Aiko opened the door fully and stepped aside, welcoming her guest inside. Faith entered the room. It was nicely set up, different than the other rooms. She set her sneakers just outside the door as a sign of respect. "" Faith said as she walked into the room. It was nice. The carpet was soft on her feet. The television was not a television as she thought, but a really nice computer. Boxes were neatly stacked up it looked like Rycon and Aiko didn't unpack much. Bunk beds, she sighed and smiled and was glad she didn't have a roommate yet. She hated those garish things. She looked at the posters and bookshelves. Well! Either this was between the two girls or Aiko had a lot of time on her hands. She nodded her approval as she skimmed over the titles with her eyes. Untranslated even! Awesome.She then looked back to Aiko with a smile, "" She rifled though her backpack and pulled out a hardback book."" She smiled and presented the thick book to Aiko. Aiko quietly closed the door after Faith entered, and watched as her guest took in the room. The gift does bring a brief, very brief, flicker of surprise to the blue haired girls face but it vanishes almost to quickly to spot. In its place is a smile and a look of gratitude. "" As she talks Aiko seems to progressively unwind, somewhat. Then she tightens up again, slightly. " Faith sighed, and she hung her head, "" She looked back up to Aiko and made her way over the edge of the bunk bed to sit down. She looked up to her hostess, "" There was a short pause there for a moment, ""
Aiko moved over and had a seat on the swivel chair in front of the computer. "" Karakuri sits there for a moment, a very brief moment, before continuing. "